3. William Hancock, b 4 Sep 1580, Devonshire, Eng; d Mar 22, 1622, Berkeley Hundred, Jamestown, VA. William married Susan Poynter on 26 Sep 1604 in Stepney, St. Dunstans', England. Susan was born about 1580 in England. He was a member of The Virginia Company of London which was a group of businessmen who were granted a charter by King James I (June 1606) for the purpose of establishing a settlement in the Chesapeake area of Virginia. The first settlement was established at Jamestown in 1607. As an investor in the Virginia Company, William traveled to Jamestown in 1619. According to an old Hancock family Bible, William left England on the ship “Margaret of Bristol” on Sept 16, 1619. Leaving his family behind in England, he was coming to search for lumber for his ship-building business. They set foot in Virginia on Dec. 4, 1619 and proclaimed it a day of Thanksgiving (the first Thanksgiving Day in America). That location became Berkeley Hundred. Plantation, a small village. William Hancock lived at Capt. George Thorpe’s house, who wanted to help convert and civilize the Indians. On Good Friday, 22 March 1622 the settlement was attacked by Indians and William, along with about 300 others, was massacred. In 1630, three of William's son Augustine came to Virginia to claim his father’s vast estate. Son Simon came in 1635, settling in Princess Anne County, and son William came in 1638. Augustine, Simon and William became prominent planters in VA.
children: John D, Major, Thomas, Mary Anna, George, William, Agnes, Elizabeth, Stephen, Judith. --William Hancock, 1739-1818, m Mary Merchant. Was a friend of Daniel Boone. Lived with him at Boonesborough, then followed him to St. Louis, MO. --Stephen Hancock, 1744-1827. He also followed Daniel Boone to MO where he died. Some think he may have helped with the writing of the Declaration of Independence. Similar stories in descendants of Benjamin and in the Nancy Corn family. John Hancock’s land bordered Thomas Jefferson’s land, so they were neighbors. "Hancock, John, b abt 1733 VA, d p 11- -1802, m Elizabeth Maddox, PS (patriotic service) VA"
1755 -- The earliest record of John "D." Hancock is in "The Douglas Register" where his marriage was dated 16 Oct 1755 in Goochland County, Virginia. He Married Elizabeth Maddox, dau. of John and Elizabeth Maddox, of Goochland and Powhatan Counties, Va., Oct. 16, 1755, by the Rev. William Douglas. 1756 -- John was granted 799 acres of land in Sussex County (SE Va) on Aug 16. 620 acres had been granted by a letter of patent in 1732. This land joined Col. Philip Lightfoot's land. Goochland Co., Virginia Fee Book named "John of Albemarle Co."
Thomas Jefferson (b 1743) also lived in Albemarle Co, VA. and the Hancock land bordered the Jefferson land. In fact, the Hancock land bordering Monticello was surveyed by Peter Jefferson, father of Thomas (Peter Jefferson died in 1757). [In 1764 Thomas Jefferson inherited his father's 2750-acre estate. In 1768 Jefferson he began building Monticello. In 1770 Jefferson moved into Monticello. In 1772 he married Martha Wayles Skelton, whose dowry almost doubled his holdings.] 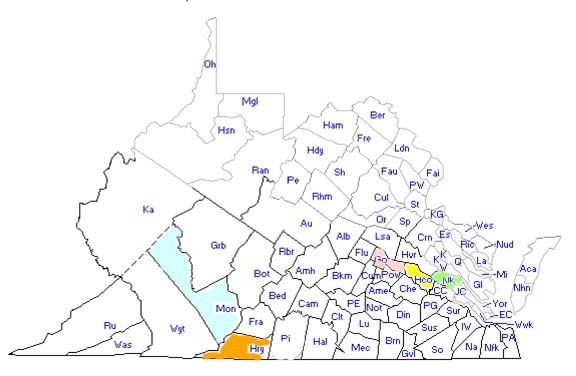 Monticello is now located in Albemarle Co.
Was a private in the Revolutionary War. 1785 -- Late in life (abt 1785) he moved to that part of Henry Co. from which Patrick Co. was taken. (Patrick Co. was formed from Henry Co. in 1791. Item. And after the decease of my wife, my will and desire it that the rest of my estate be equally divided between my five daughters and my son William Hancock, to-wit: Nancy Corn, Rodie Lane, Elizabeth Mayo, Judath Mayo, and Susannah Hancock. There are 18 Hancock graves at the Liberty Primitive Baptist church cemetery, which is in the area of the NE side of Bull Mountain. Maybe this is where he was buried.